DES MOINES – The Iowa Barnstormers have signed kicker Nathan Criswell to the 2019 roster, Head Coach Dixie Wooten announced today. 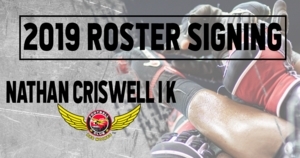 Criswell (5-11, 195, Iowa Central CC) a native of Grinnell, Iowa joins the Barnstormers for his rookie season in the Indoor Football League (IFL). Collegiately, Criswell attended Iowa Central Community College where he appeared at kicker for the Tritons in 2013. During the 2013 season, Criswell earned honors as Second Team All-ICCAC.